We are excited to announce the release of Conferences i/o Version 2.0! The changes made with Version 2.0 are primarily backend, performance focused — the application now responds faster than ever — but we also made a few minor improvements to the current features that we think you’ll enjoy. One of the most common items of feedback that we heard about Version 1 was that navigating between admin / moderator / attendee roles was often confusing. We are now introducing a navigation panel (left-hand side of screenshot below) which allows users to easily switch between different roles on the app. The navigation panel will only display a tab for the role(s) that the user has permission for. For example, the Admin tab will only display for a user if they have previously signed in as the admin. Attendees will not see the ‘Moderate’ or ‘Admin’ tabs. The navigation panel will collapse and open at the user’s discretion in order to maintain a high quality experience when using a mobile device. With Version 2.0 we have added a new Q&A moderation action called “Marking a Question as Complete” (checkmark icon). We’ve also changed the purpose of the heart icon from being used to “save” a question to now being used to “Favorite” a question. Once a question has been addressed by the presenter you can mark it as ‘complete’ by clicking the new checkmark button. When a question is marked as ‘complete’ it will be removed from the attendees’ page and they will no longer see that question. ‘Completed’ questions will remain visible on the moderator page but will be de-emphasized (grayed out). As a moderator, you may see certain (really good) questions from attendees that you definitely want to ask during the Q&A session. You can now use the heart icon to “Favorite” a question at any time. 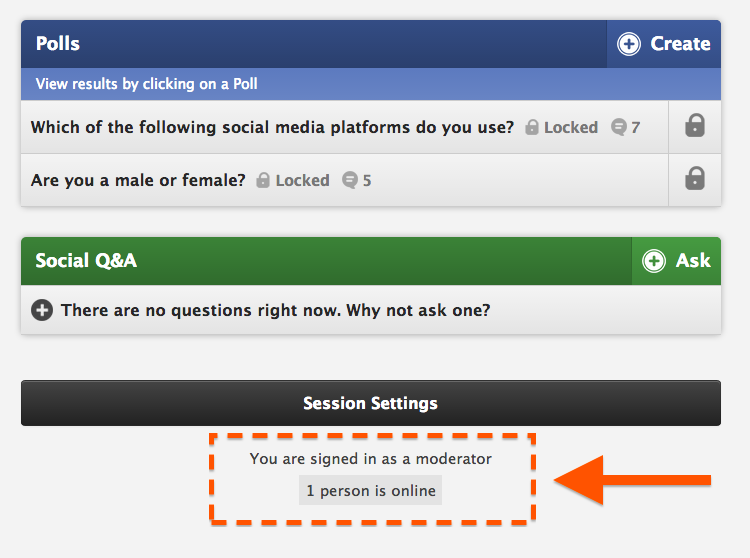 When a question is “Favorited” it will be highlighted on the moderator page (nothing changes for attendees). This makes it easy for you to remember those questions that you definitely want to ask, even if they aren’t at the top of the list based on the # of votes. With Presentation Mode in V2, when you transition from Poll question to Poll question the system will automatically bring each attendee into the Poll. Attendees no longer need to click “go back to session” or “go to next poll” … all they have to do is respond. At the bottom of the Session page moderators will now be able to see how many attendees are currently active in their Session. The ability to integrate Polls directly into Powerpoint has been a major goal of ours for some time now. One of the other major benefits of Version 2.0 is that it makes Powerpoint integration much more feasible from a technical perspective. We are hard at work building this plug-in and we plan to have a beta version available in early August.